. : LuCaspeRobin + Thomas ;-) :|: Sebastiaans' section :. - Married for 2 years! 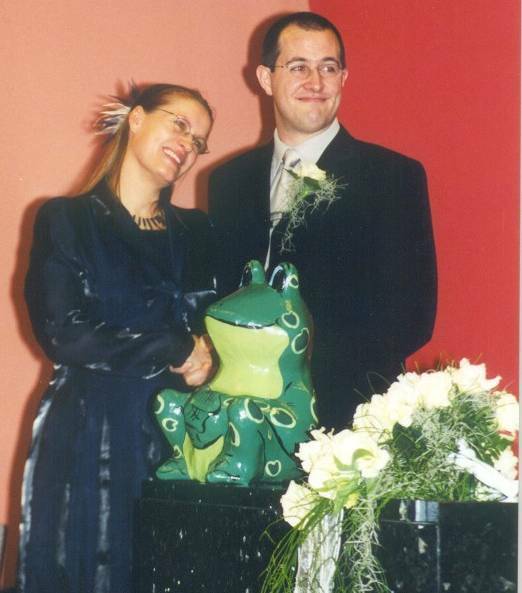 Today Marjolijn and I have been married for two years. By golly how time flies. I'd taken the day off so that we could do some things together. The important most thing we did that day was getting our weddingrings engraved - finally. When we bought the rings, after a six month hunt returning to the first juweller we'd visited, we would get the engraving for free. But we never quite ot around to figuring out what we'd like engraved in our rings. Today it was clear! Eachothers names and the date of the wedding. But not just eachothers names, no, it was to be eachothers names in our own handwriting. And I must say that we have a very talented jeweller. If anyone is looking for a talented forgerer - go to Nobilia jewellers in Utrecht! So now the marriage is complete, rings engraved and all. 3 years anniversary - here we come! Post a comment on "Married for 2 years!"